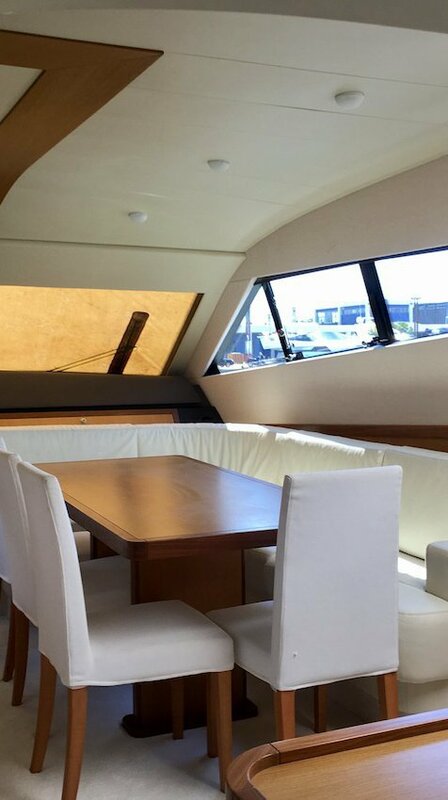 Clearly, this boat was built for cruising the Mediterranean in season and getting the sun. 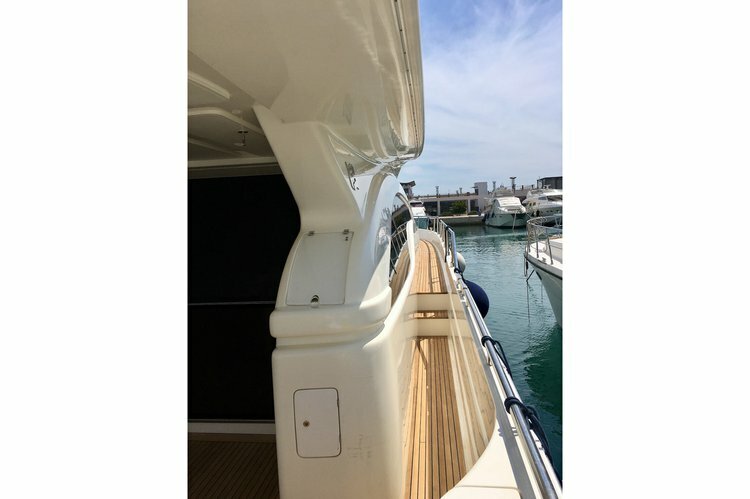 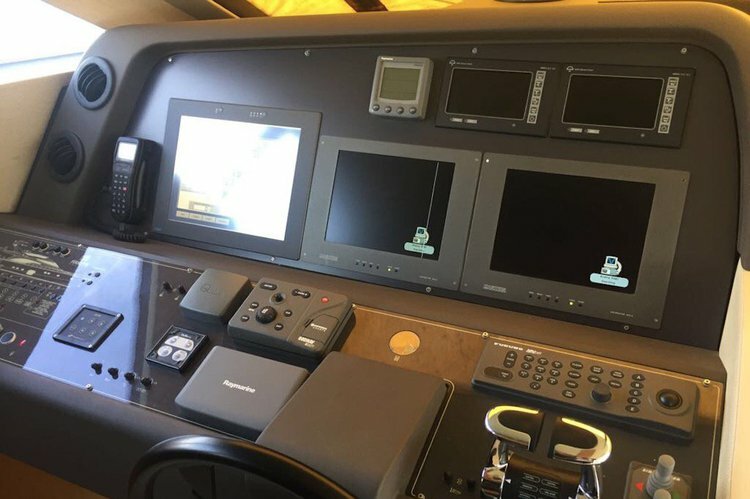 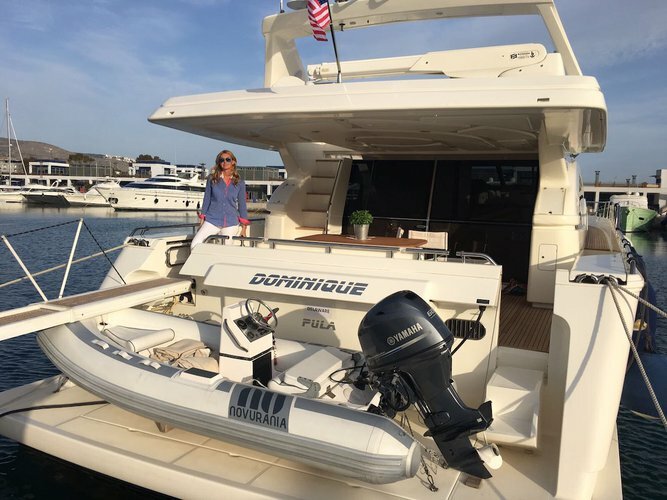 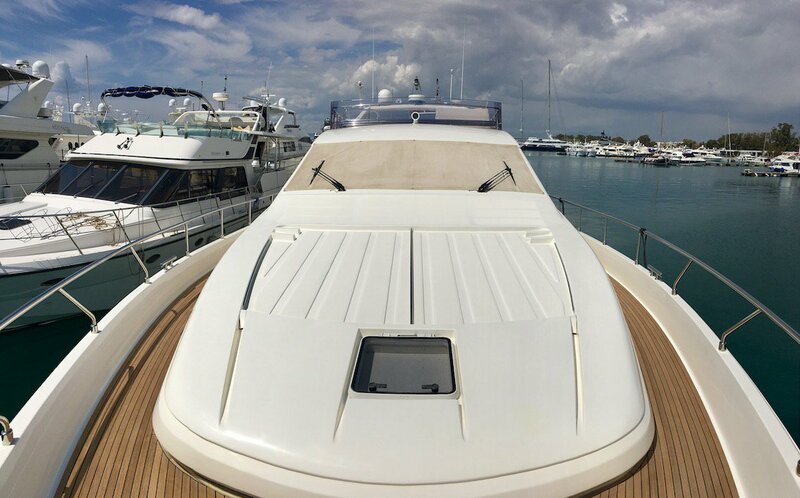 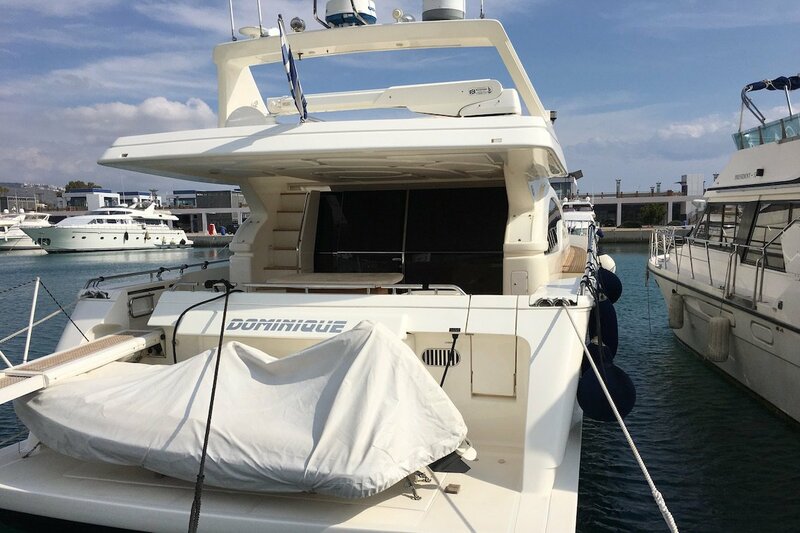 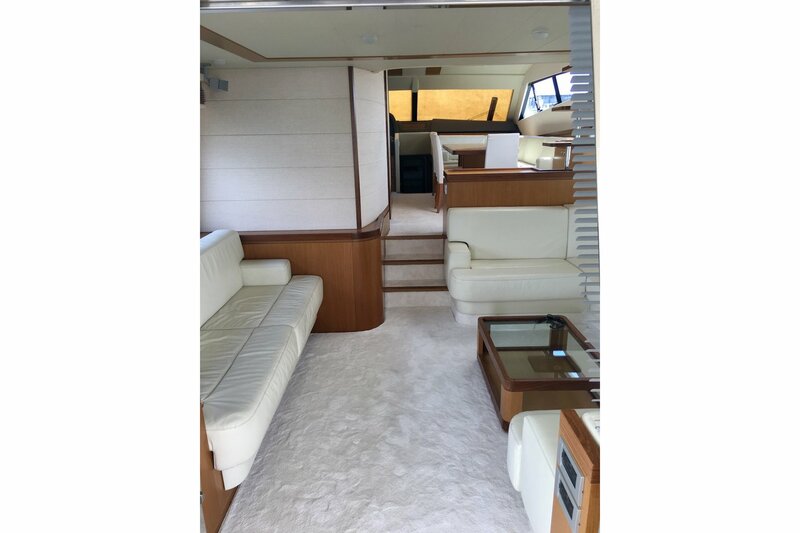 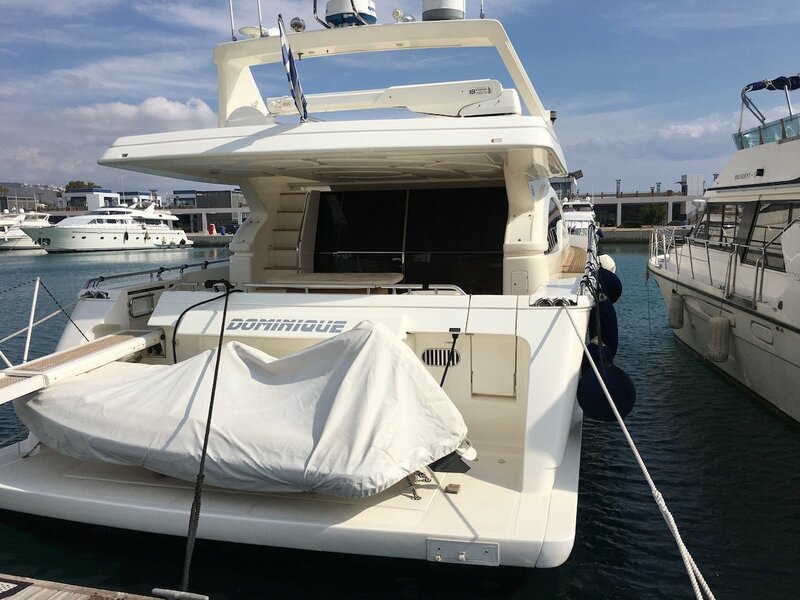 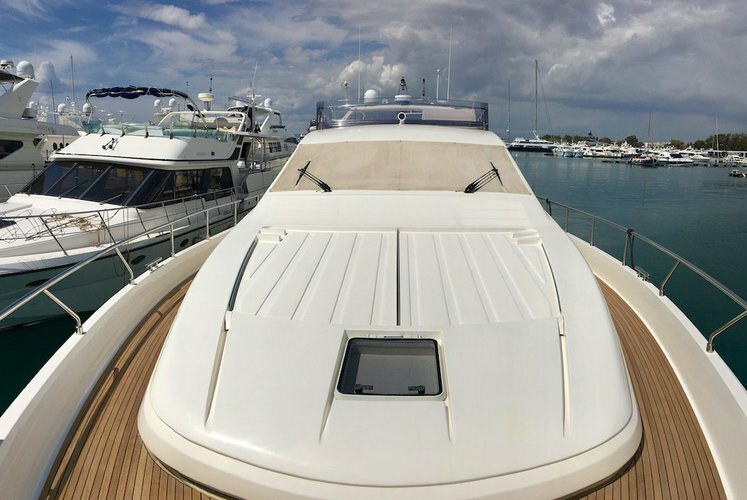 Its large flying bridge and its three large sunning pads (one on the bow and two on the flying bridge) are big enough to handle all of the boat’s guests laying out at one time. 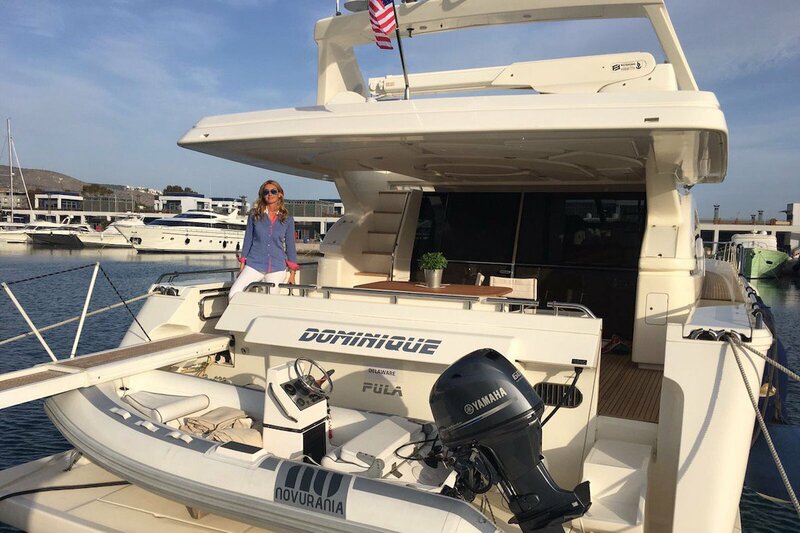 All one needs is plenty of Coppertone. 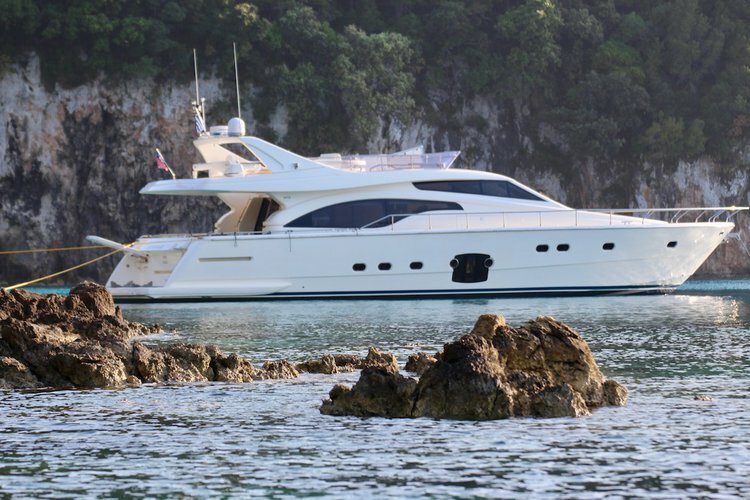 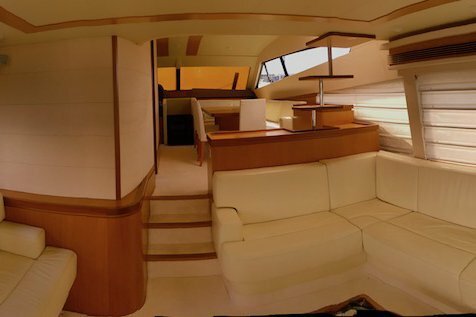 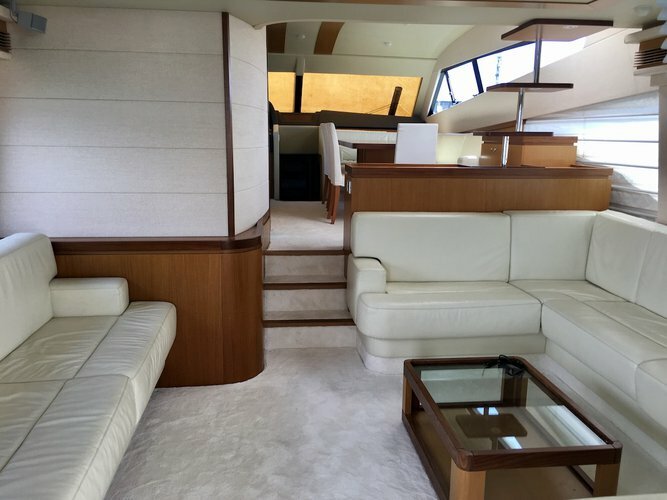 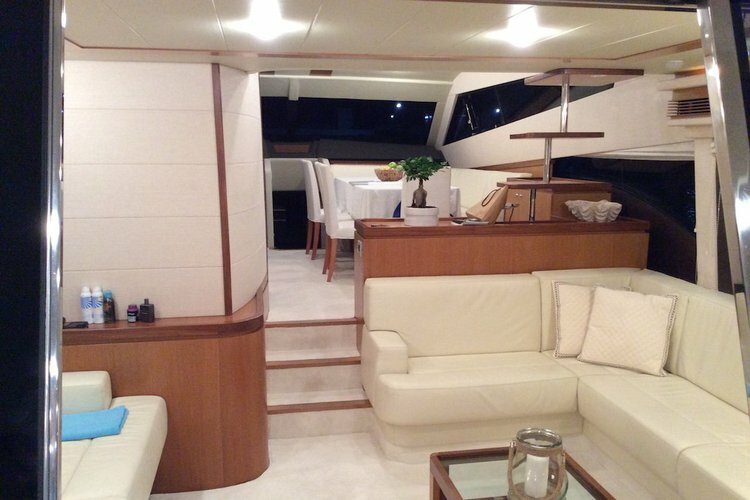 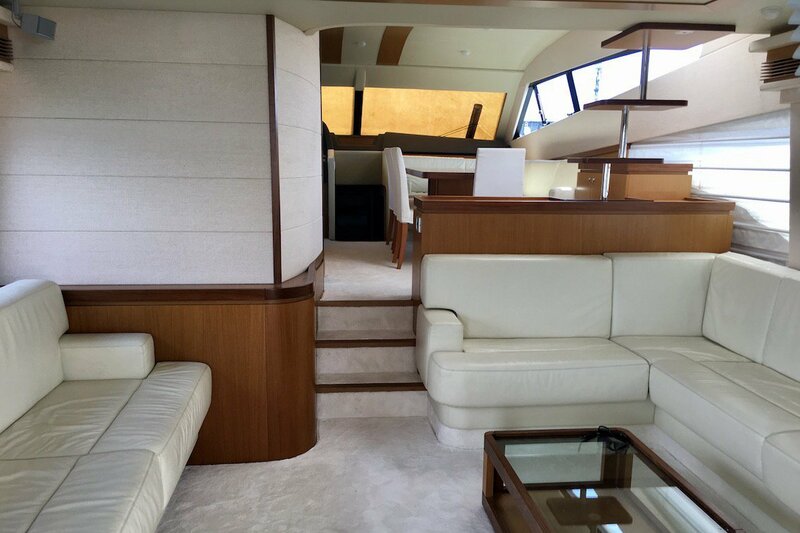 The Ferretti 681 is about entertaining. There are three different venues for eating, and a wet bar on the flying bridge. 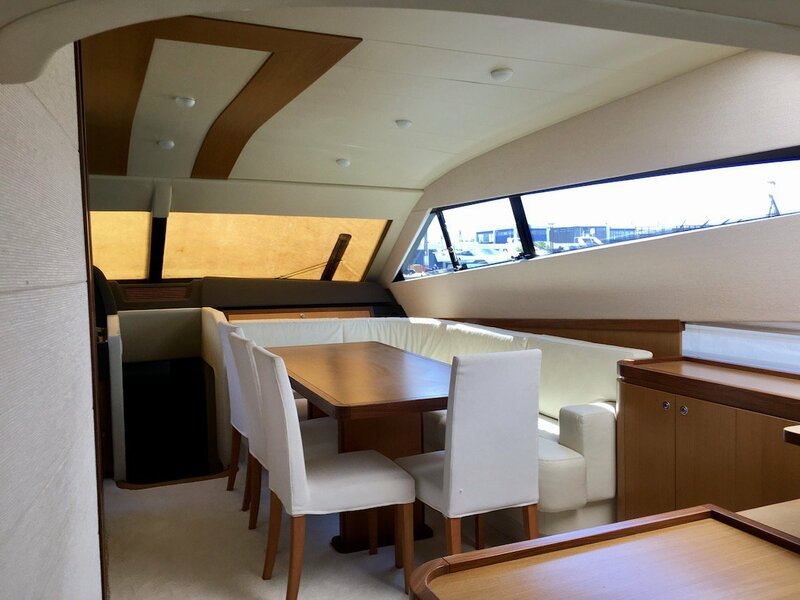 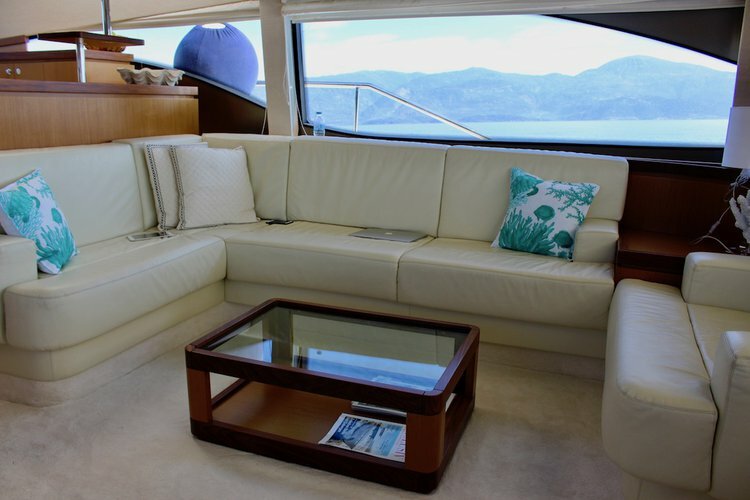 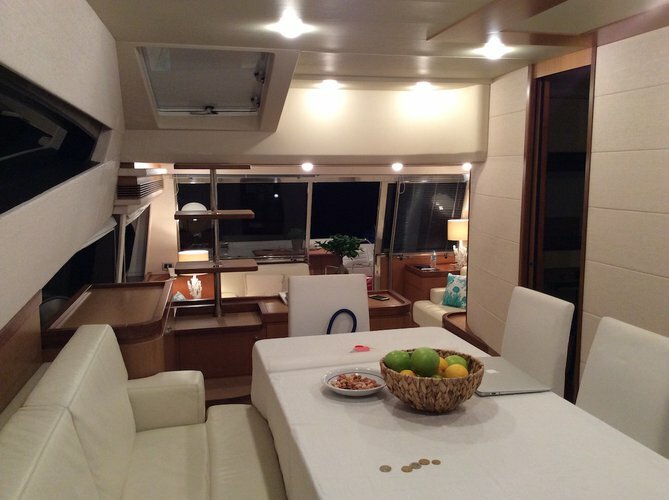 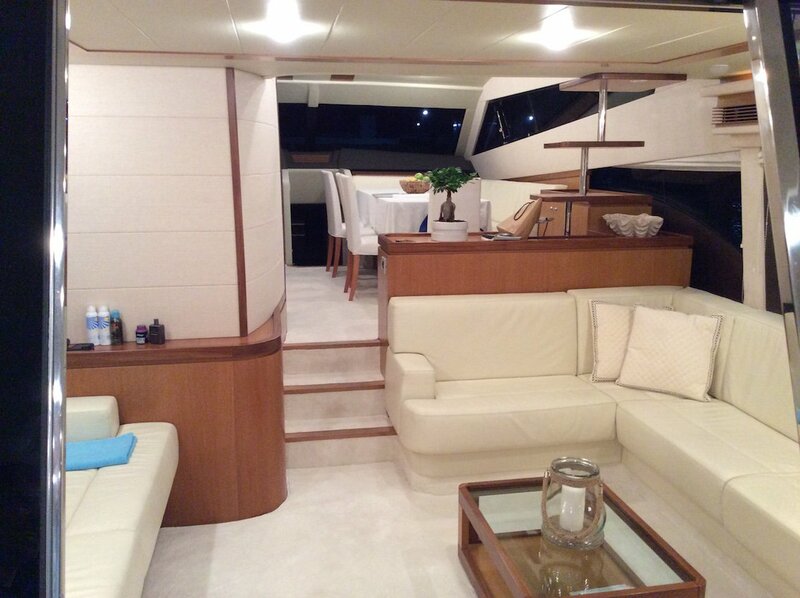 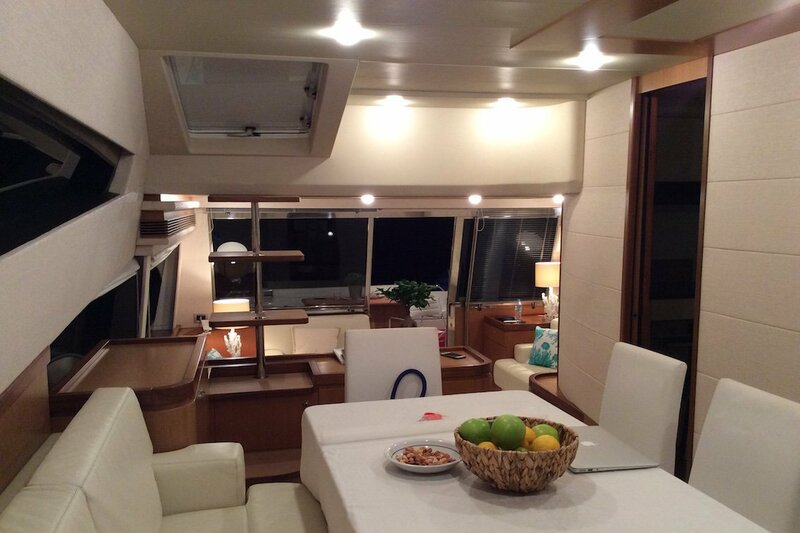 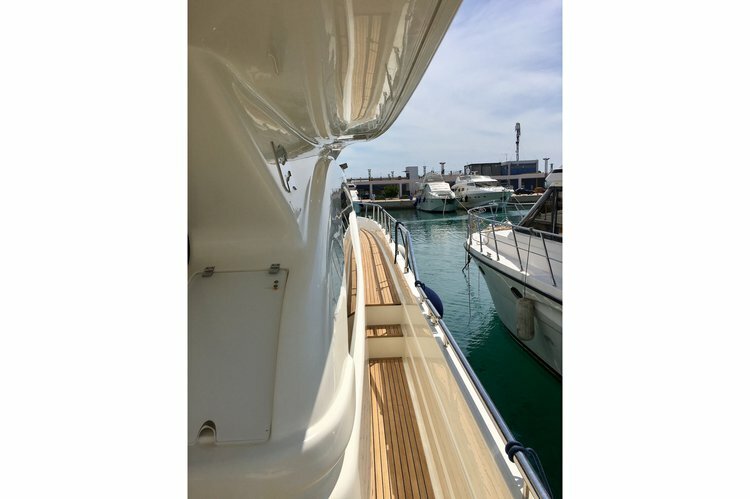 The aft deck and dining table is required equipment on any Med yacht. 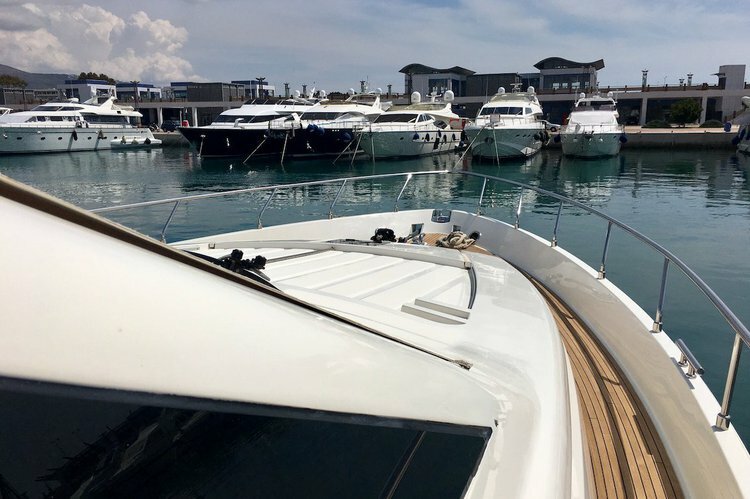 With the boat Med-moored at the dock, guests can lunch al fresco in the shade and see and be seen by those strolling along the dock. 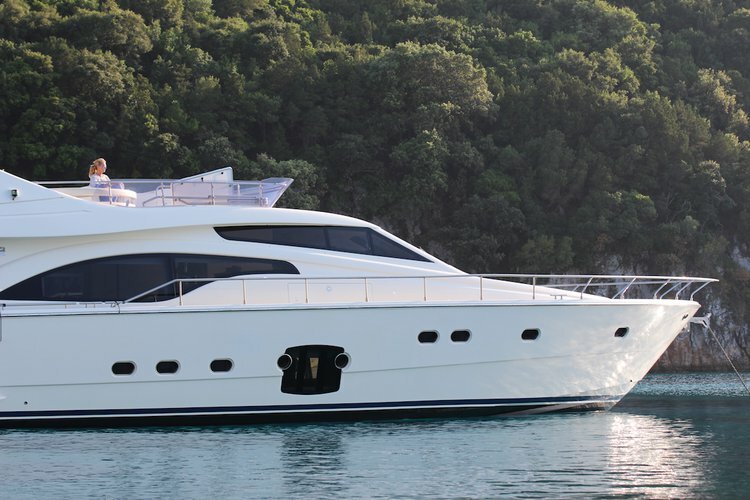 Because of its weight and hull design, the 681 can handle relatively rough water and still go fairly fast. 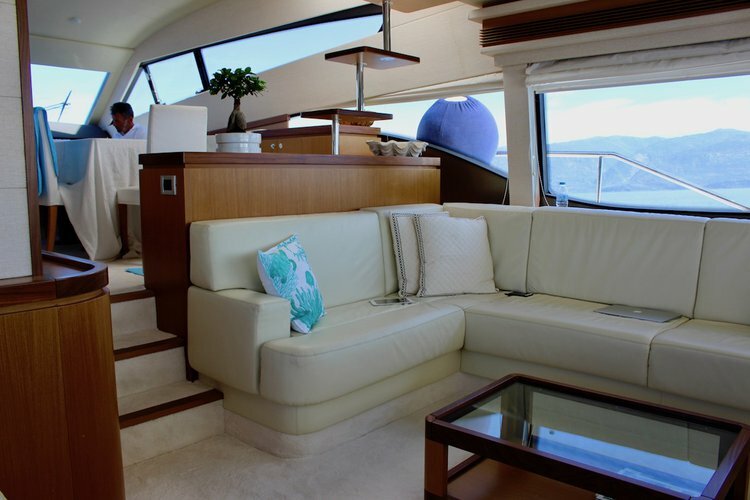 That means it is ideal for cruising, as well as lazing along the riviera. Its hull also lets the boat extend the Med season into the shoulder months of late April and May and September and early October. 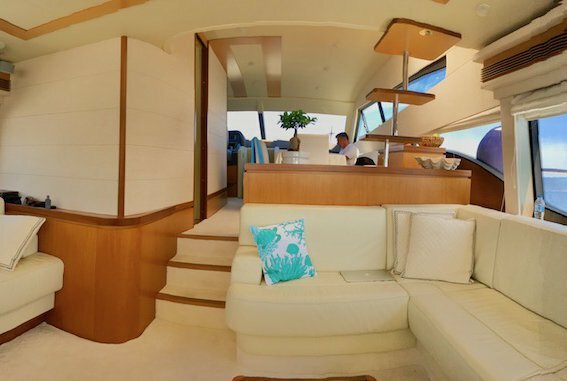 Two guest cabins; one with ample space to permit the positioning of the beds in an L position & the VIP cabin, an elegant and spacious alternative with private bathroom featuring teak flooring and marble basins. 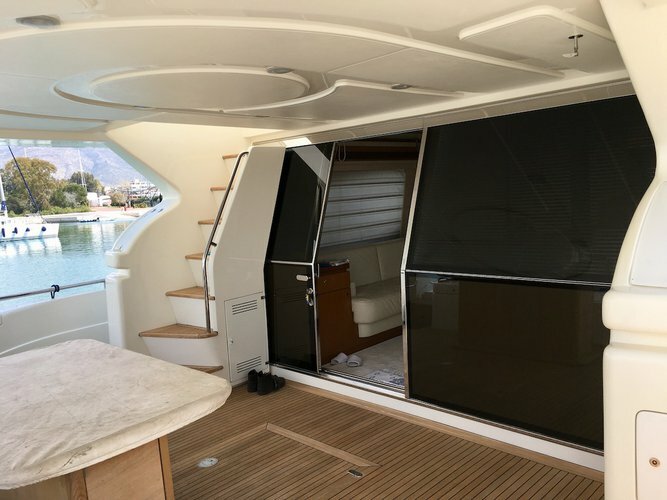 The master cabin with bed facing the rear deck, has been enriched with a large semi-circular sofa that allows one to admire the sea view from the famously characteristic open-view window structures, openable at the lateral portholes. The flying bridge is furnished with circular sofa, revolving table and two large sundecks to enjoy the sea. 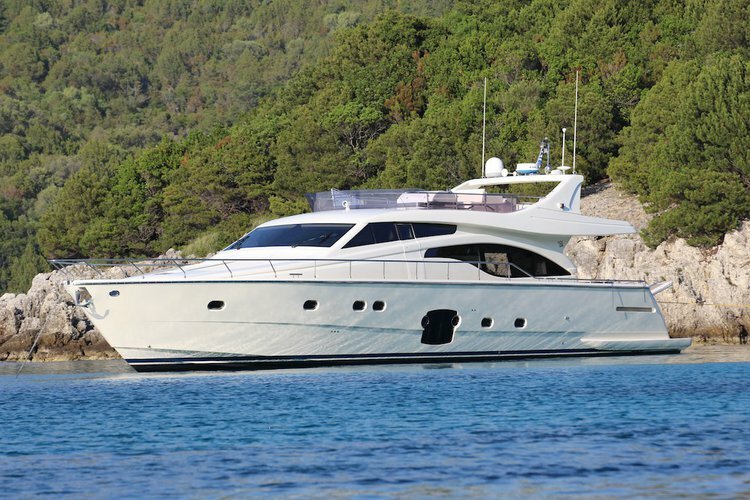 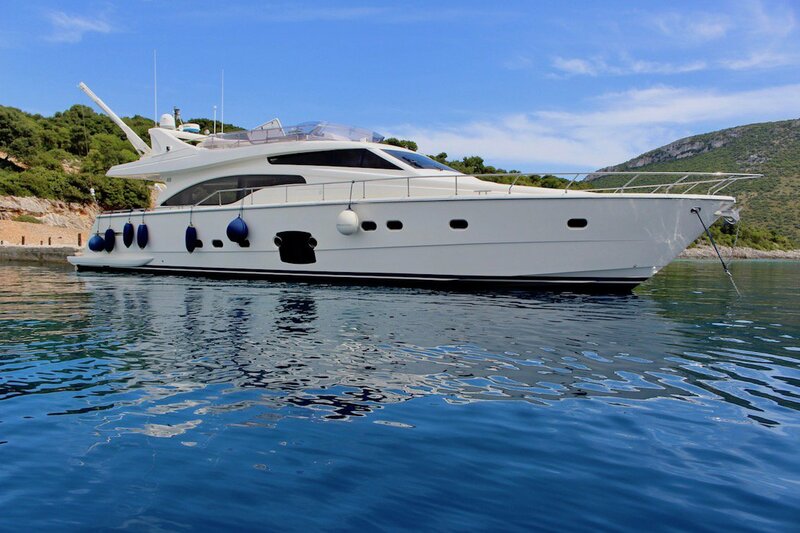 The Ferretti is more than just a pretty face. 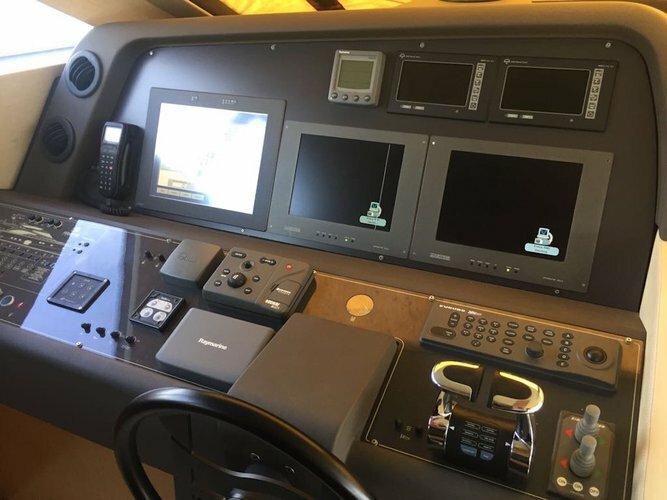 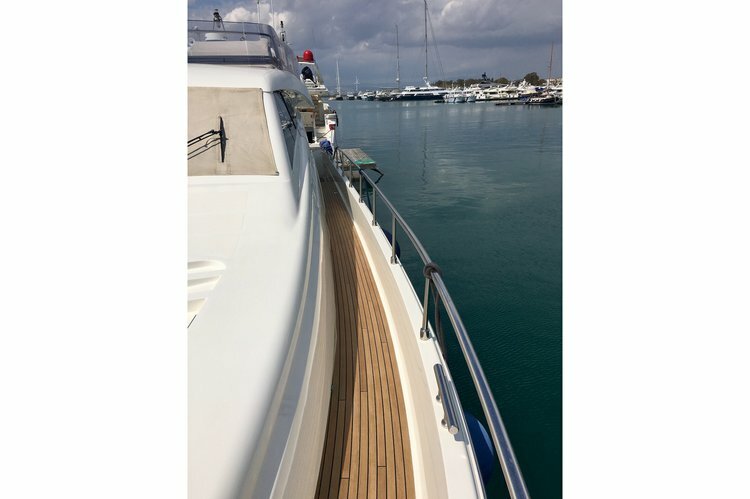 She has the construction and the equipment to admirably satisfy even the most demanding yachtsman in warm climates. The larger Ferrettis are, to a great degree, simply scaled up versions of the 681. 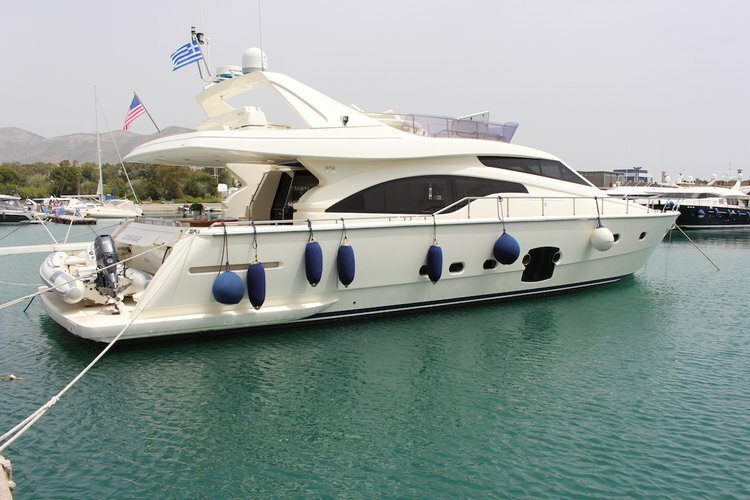 With four staterooms, 30-knot speed, and room for water toys, one wonders why anyone would need something bigger. THE STORY OF OUR LIVES, OR WHY ARE WE DOING THIS? 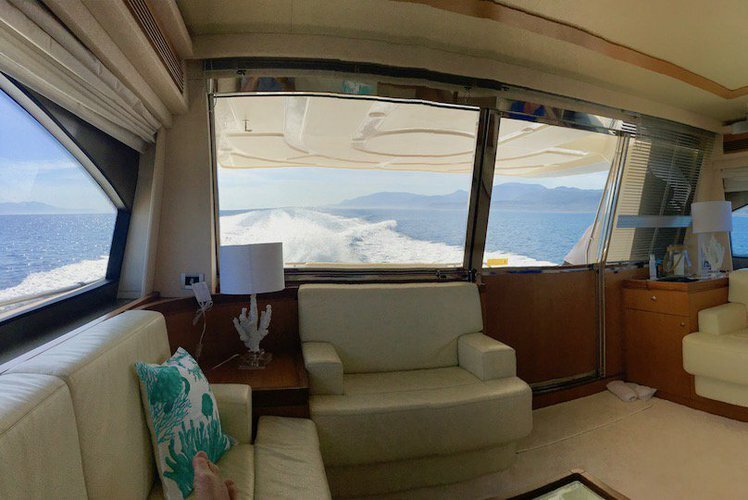 We have been collecting ingredients for your perfect holidays during our entire lives - we just didn't know it. 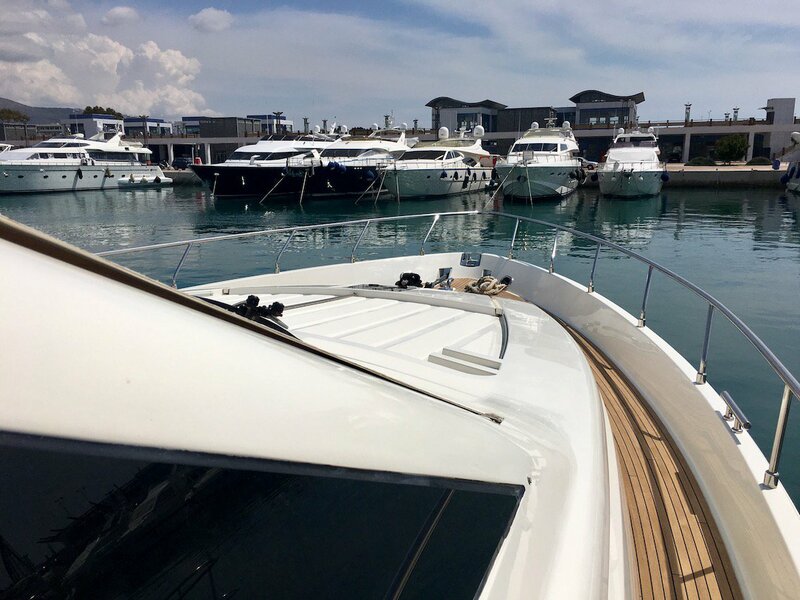 Having the privilege of being native Istrians, living and breathing Istria's most authentic experiences, gave us the ability to truly know everything that is on offer and filter out only best of the best. 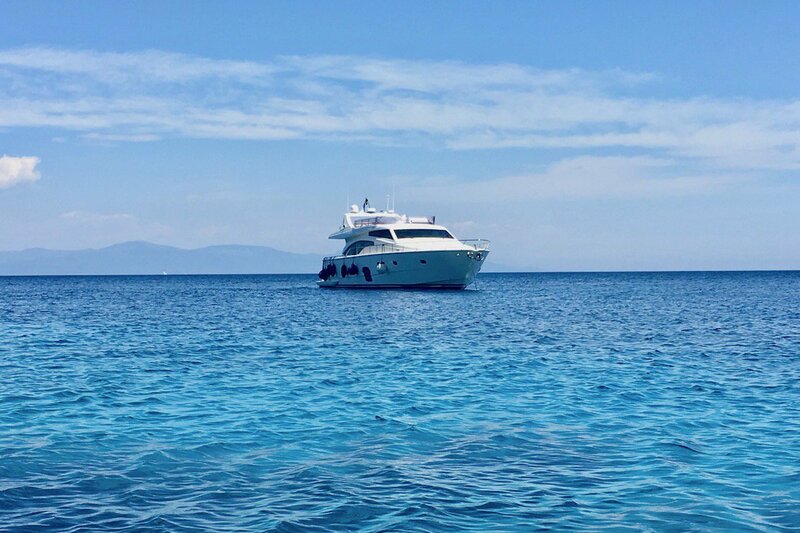 Condensing a lifetime of experiences into the form of a perfect vacation was a difficult task, but we feel confident that the result comes as close as possible to perfection.